Today’s post is an updated repost from July, 2010. I’ve tried several different recipes in the past, but so far, this one is my favorite. It was given to me from a woman at church many years ago (with permission to share). I was never able to make a full batch before as I didn’t have a stand mixer — so I’d make a half (or even a quarter) batch at a time and call it good. 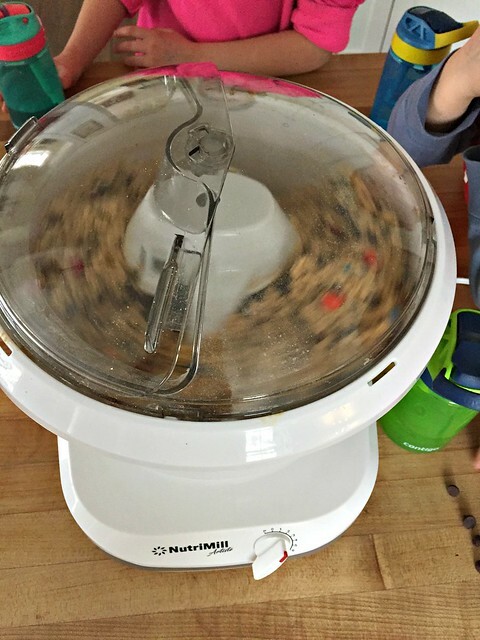 HOWEVER, when I got the NutriMill Artiste Stand Mixer a few months ago, I knew exactly what recipe I wanted to make first — a FULL batch of monster cookie dough! 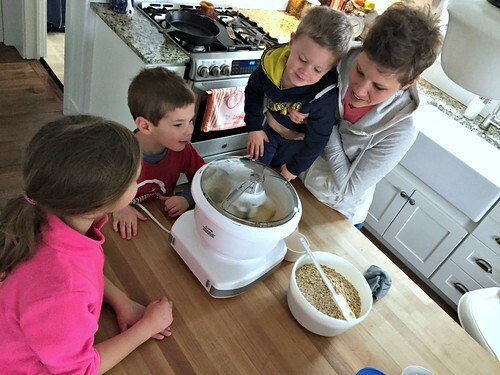 The mixer combined this ginormous batch of dough with ease — it was SO fun for the kids (and for me) to watch it mix everything so quickly and perfectly, with NO effort from me! Transfer cookies to cooling rack until completely cooled. Then freeze or store in airtight container. I rarely ever bake all 12 dozen cookies at one time — maybe 3 or 4 dozen right away, and then I freeze a bunch of cookie dough for later. 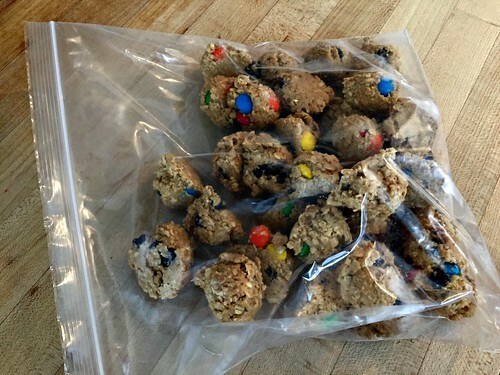 For freshly-baked cookies at a moment’s notice, I flash-freeze balls of cookie dough on parchment paper, then put them into a ziptop bag in the freezer. I can simply pull out 6 balls and bake them with dinner for a fresh-from-the-oven dessert with no hassle or clean-up! 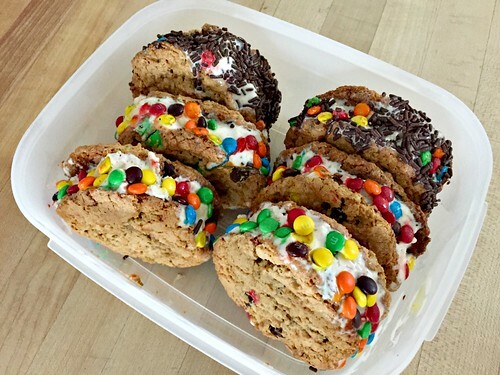 Another option to use up ALLLLL these cookies is to make Monster Cookie Ice Cream Sandwiches by spreading slightly softened ice cream between two cookies, and then rolling the cookies in chocolate chips, M&M’s or sprinkles. 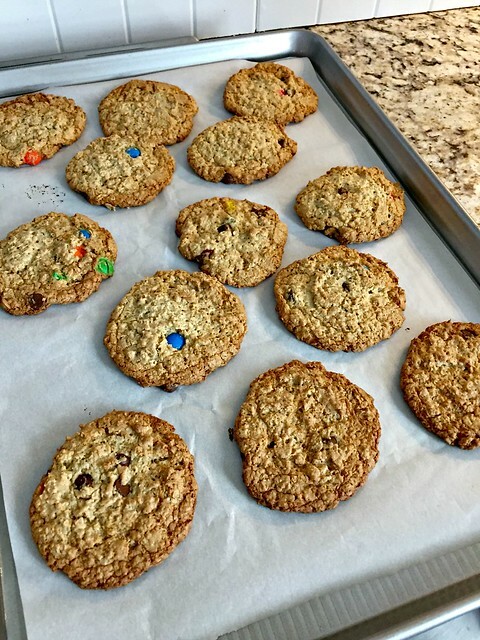 In my opinion, this recipe for monster cookies is definitely worth the effort, but if you’re looking for a quicker (and smaller) recipe, click here for my “Simple Monster Cookie” recipe. Made these this weekend! The only thing i can’t figure out is my batch only made 70 cookie dough balls for the freezer. A far cry from your 144! I didn’t even feel like I made the dough balls very big, maybe 2 tbsps? I know your recipe even says to place large scoops on the tray-I am just wondering if you know how big they are. I can’t believe I only got half the amount you got. crazy — your scoop must be bigger than mine! I was actually thinking I should change the post to say exactly what scoop I use. Now that I have kids, I no longer use a “large scoop” but rather a smaller scoop since they can’t eat as big of cookies! My mom made these when I was little! I’d lost the recipe! well now you “found” the recipe again — yay!!! make them soon! Looks delicious! I noticed in a couple pictures that you have cookie dough in a storage container. Do you store dough in the fridge to use through the week? Does it hold up? 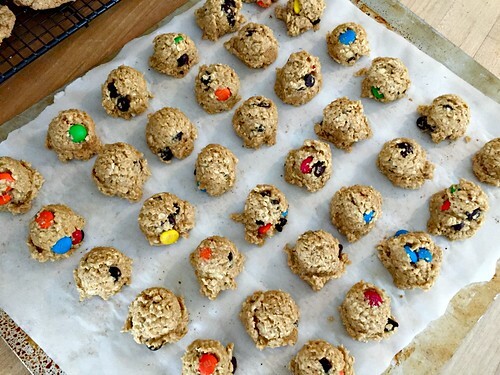 I typically flash freeze cookie dough balls, but the thought of sometime just storing the dough in the fridge to make through the week would be great! I freeze containers of dough for making cookie bars and big batches of cookies, but I also freeze dough balls for making just a few cookies at a time. However, you could definitely keep it in the fridge for a week! 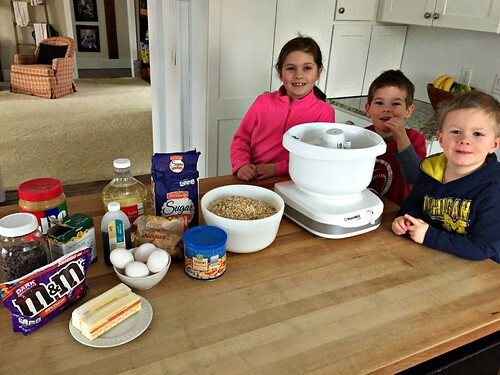 I was going to make regular chocolate chip cookies with my kids today but this post just changed my mind! Can’t wait to try these, thanks for the recipe! 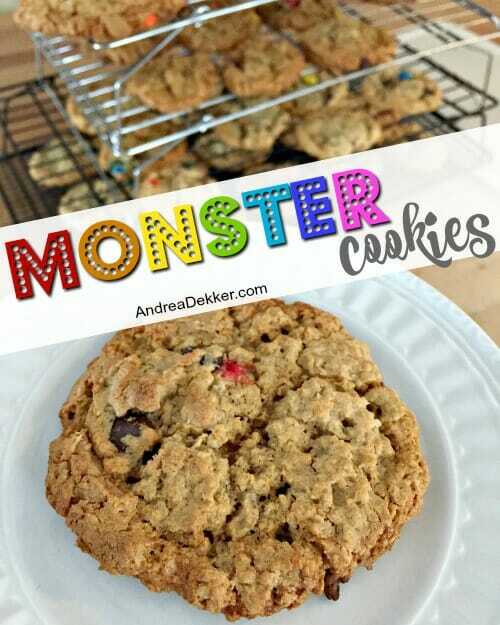 My husband and I love monster cookies with coffee or hot chocolate. They hold up so well to dunking. 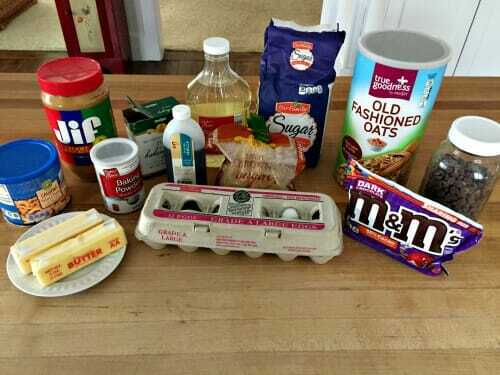 I use the mini chocolate chips and mini M&M’s. I usually bake a dozen and freeze the rest like you do. What’s the difference in the oats and do you have a suggestion for the peanut butter? My son hates it. I guess try another type of “nut butter” or even biscoff spread. 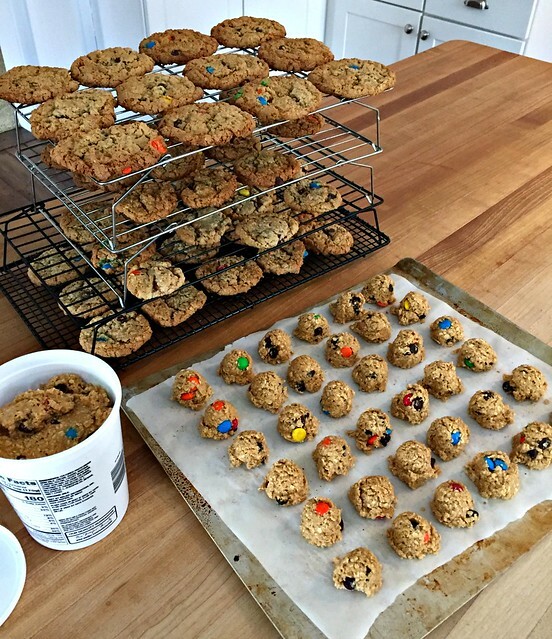 As for the oats, if you use traditional oats, the cookies will be more “flimsy” and more easily fall apart in your hand. 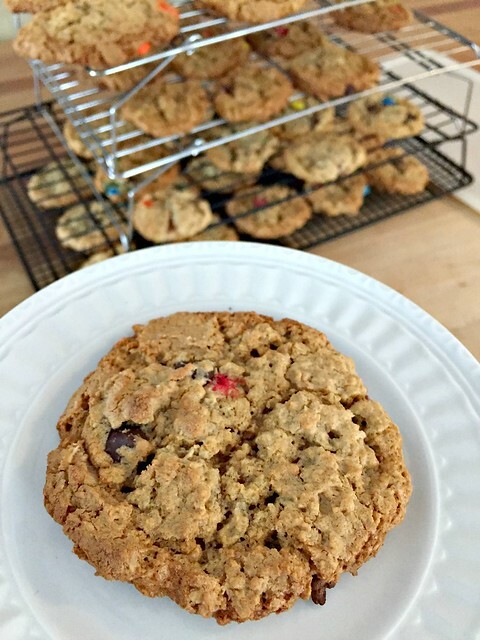 They still taste amazing, but in my experience, the quick oats help to hold the cookies together much better! I would love to try this recipe. Any idea on a substitute for the corn syrup? well, I’d probably just leave it out — but why do you need a substitution? Can you not find it at your grocery store? I am just picky about using as much whole unprocessed food ingredients and corn syrup is on that list! I’ll let you know how they turn out without the syrup. I would use honey in place of the corn syrup. I would be tempted to try maple syrup, keeping in mind that it has a different consistency than honey or corn syrup. I’m with you, on avoiding high fructose corn syrup ! 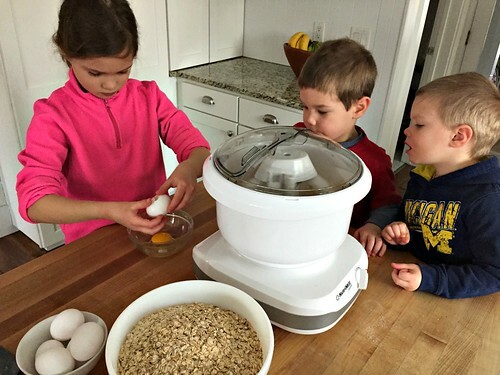 Have you frozen the dough or only the baked cookies? 12 dozen is a lot of cookies! Can’t wait to try them! We are making these today! How do you freeze them? Thanks for the awesome recipes! no instructions… just put them in some type of bag or container and pop into the freezer! I made these for a wrestling tournament and the became the team favorite. No tournament was complete without monster cookies! Great recipe. I use the same recipe! A simple change in texture is to grind the oats in the blender, pulse till like course flour, it really changes the recipe, taste is more intensified, also helps for kids who don’t like the oat texture. It’s a great gulten-free recipe, or at least no flour! 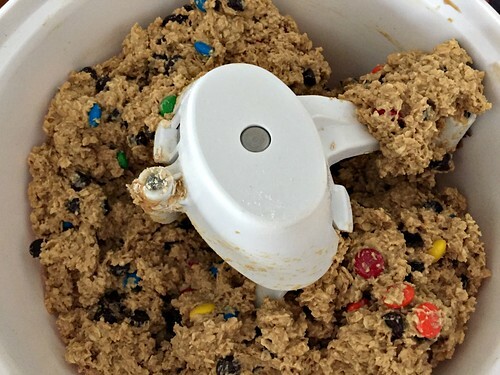 Which blade do you use to mix the cookie dough? I just use the “normal” blade — not the dough hook or the whisk.